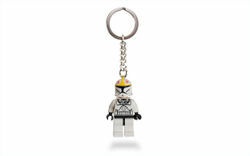 853039 Star War Clone Pilot Key Chain is a Star Wars Key Chain released in 2010. This is a description taken from LEGO.com. Please do not modify it. Navigate your way with a LEGO® Star Wars™ Clone Pilot™! Find your way with an authentic LEGO® Star Wars™, Clone Pilot™ minifigure key chain. Makes a great backpack charm! Facts about "853039 Star War Clone Pilot Key Chain"
Navigate your way with a LEGO® Star Wars™ Clone Pilot™!